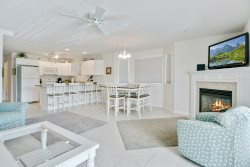 Escape Point A-1 is ready to make your OCMD Vacation Dreams come true! Check out the Chincoteague Island Tide Schedule to find the best time to visit our beach at Assateague island National Seashore, or to enjoy the countless water activities that we have around Chincoteague Island! Kids will love low tide when more beach is exposed, creating tidal pools and a bigger play ground! Low tide is also a favorite for Chincoteague Island surfers, as the outer bar is more reachable. Low water is great for clamming. Slack water is great for crabbing. Moving current (rising or falling tide) is best for fishing, including surf fishing. Just select your favorite tide location from the drop down menu at the top. Thanks for checking out the Seaside Vacations tide charts.